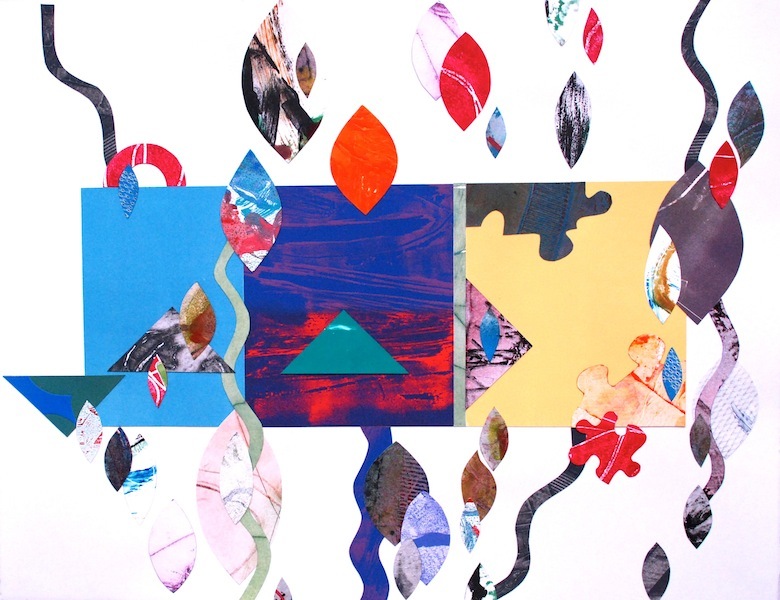 I wrote about how I used the marbled paper I made as the basis for collage, recycling pieces of prints (mine) and found paper to create a design where line, shape, color and texture work in tandem with the ebb and flow of the marbling, moving with it and against it across the paper. I wanted to do a project using haiku poetry in my work. Haiku is a form of Japanese poetry traditionally comprised of seventeen syllables in un-rhymed lines of five, seven and five syllables. Contemporary poets change that up a little using different numbers of syllables.. Haiku poems typically evoke an impression or feeling having to do with nature. Again, contemporary versions may stray from this strict definition and turn inward to express something more personal. I took me a while to realize that combining a haiku with collage on suminagashi marbled paper was what I was looking for. And so, the Haiku Project was born. I reached out to you, my readers, requesting original haikus. You write the poem, I’ll use it in my art and credit you by using your first name in the title i.e. “Brad’s Haiku.” You responded, generously, sending me beautiful poems. 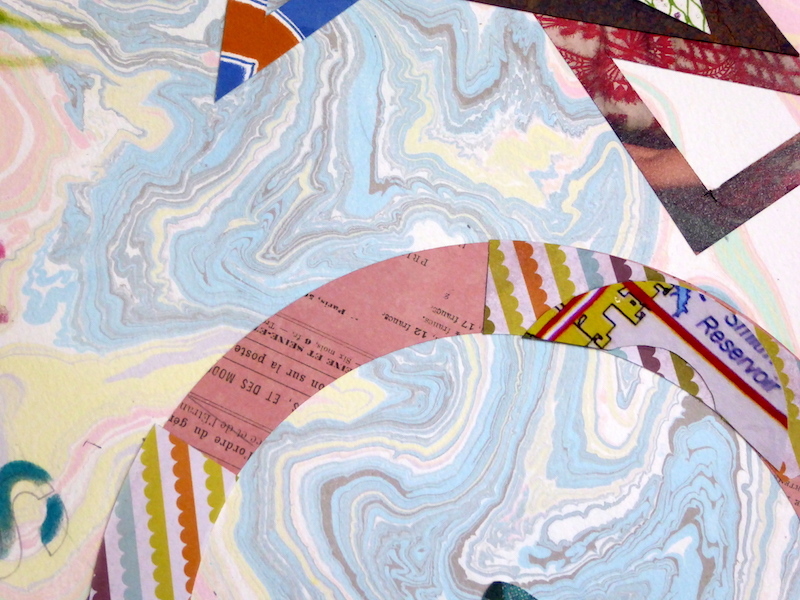 The collage is built in layers beginning with the marbled paper. Next, I write the haiku using stencils with pencil and pastels in a pattern of movement that complements the flow of the marbling. The cut paper collage elements are next. Here is a detail at that stage. 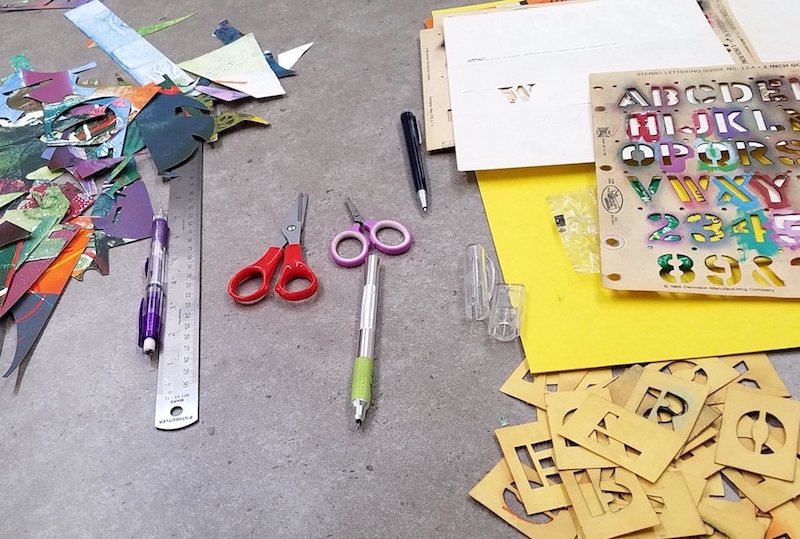 Last, the cut out letters (from print scraps) are overlaid on the previously stenciled letters. Still with me? 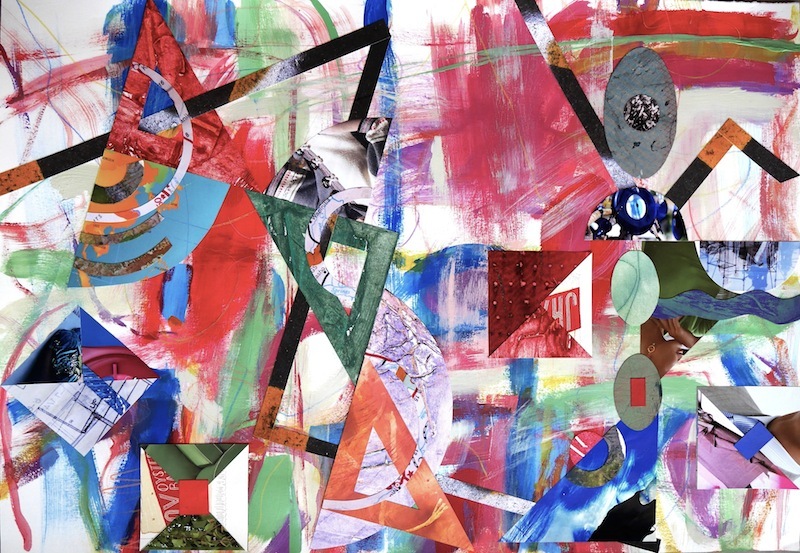 A completed collage looks like this. 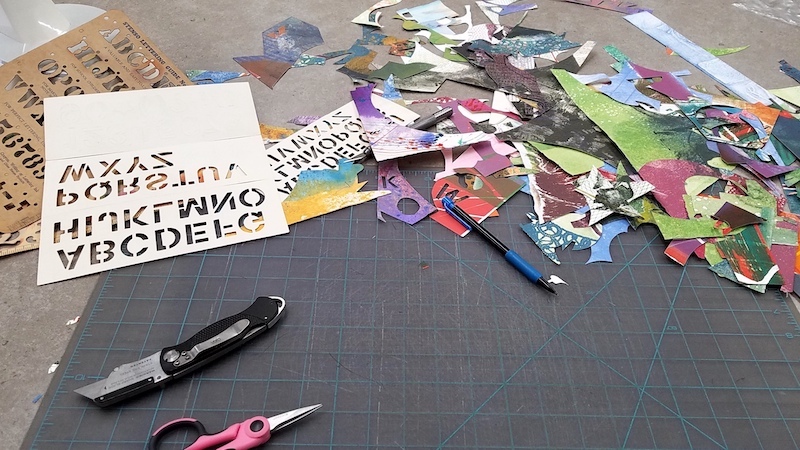 Here are the words for “Brad’s Haiku”, cut from print scraps, which will be the final layer in the collage. Yes, it takes good eyes and steady hands to cut and glue them. 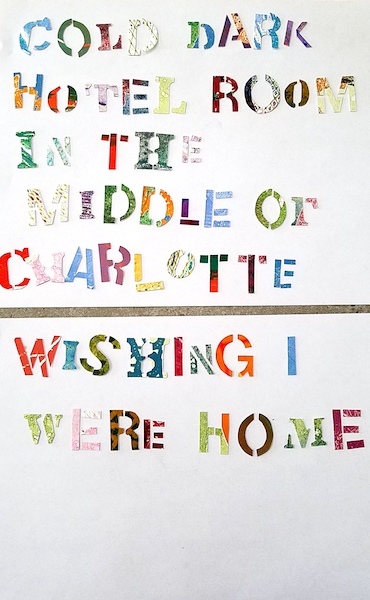 Here is “Brad’s Haiku” with stenciled letters and collage. Here are the haiku poems in the collages. For me, it’s poetry in motion. Let me know what you think or feel and do send a haiku if you haven’t already. 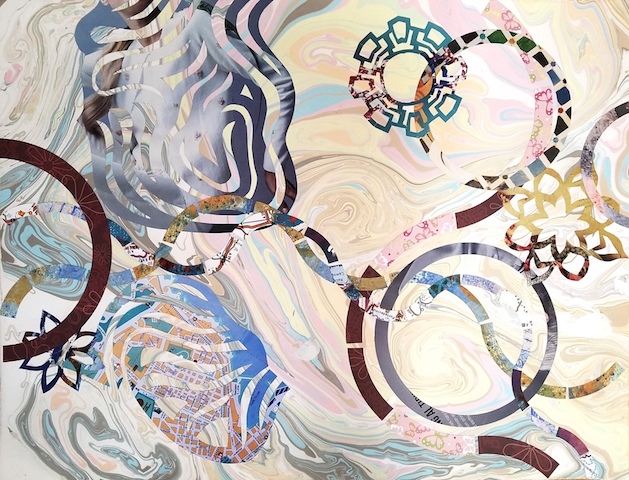 I have been working on a series on paper combining Suminagashi marbling and collage. 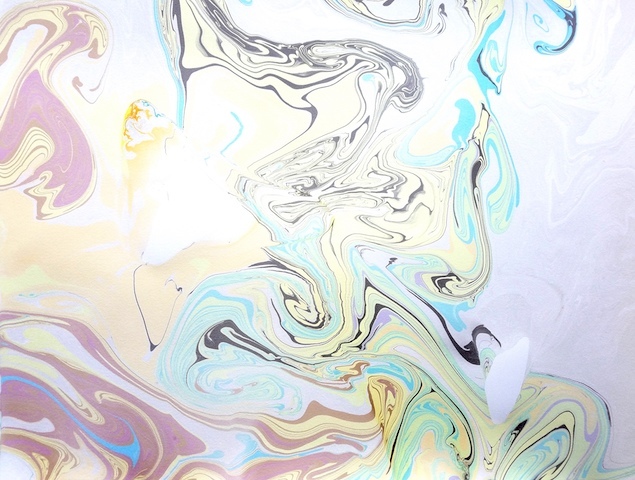 Suminagashi is a Japanese marbling technique using special pigment inks. These inks are gently tapped on the surface of water in a tray with fine brushes. 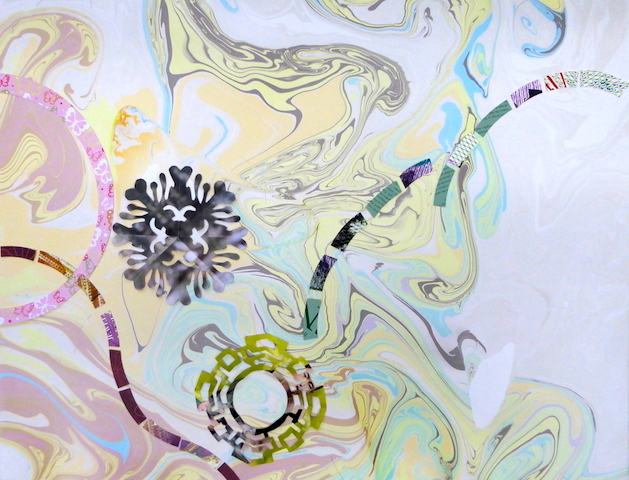 The movement of the water and my intervention moves the inks around creating swirls and ripples. The inks are intense but they appear pale and indistinct floating on the water. The magic occurs when the paper is laid on the water and lifted off. The marbled pattern appears! I’ve often said I love the unpredictability of printmaking. 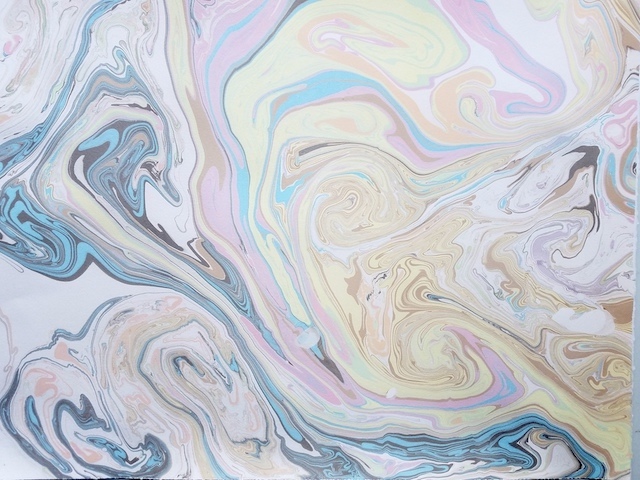 Suminagashi marbling takes unpredictability to a whole new level. 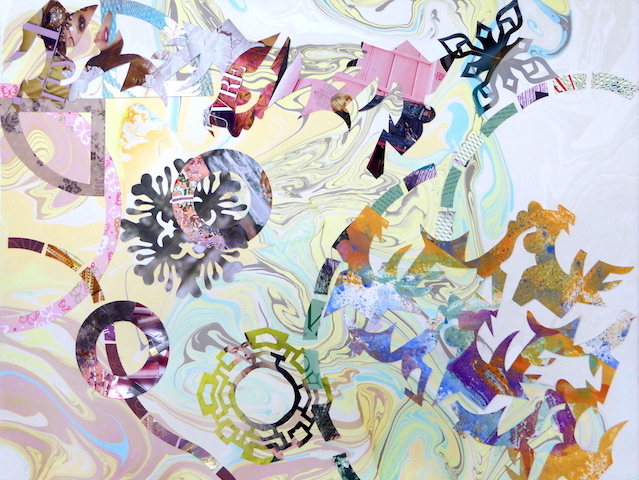 The collage elements are applied to the dried marbled paper. 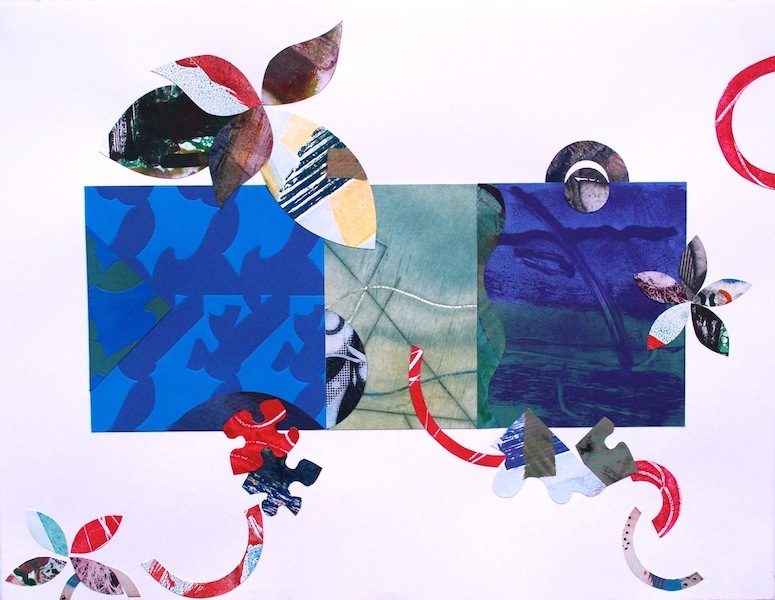 Like all of my collages there is a combination of my recycled prints and found paper. 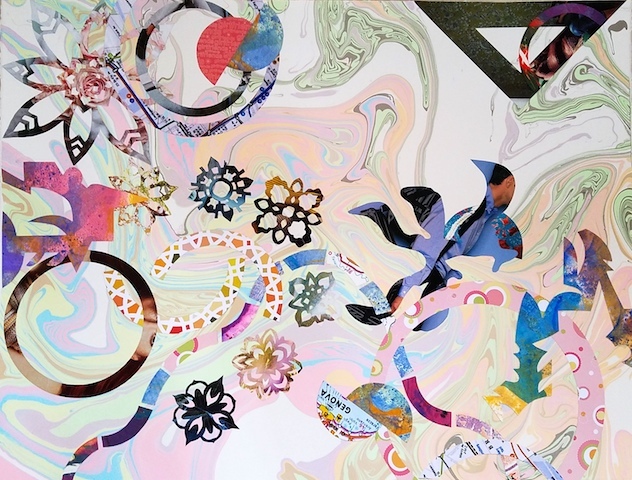 The colors, shapes and design of the collage work in tandem with the marbling. 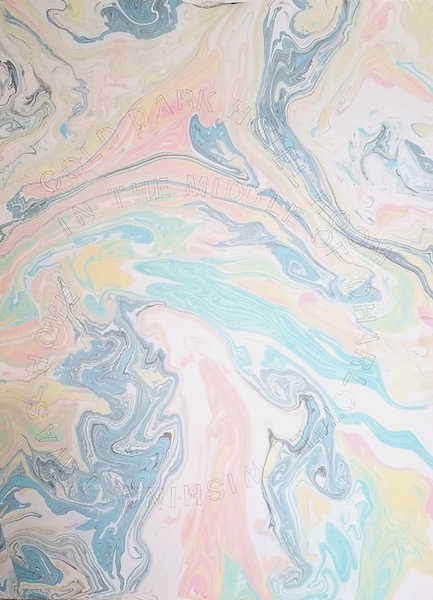 To give you an idea of the process from start to finish here is what the marbled paper looks like. Little by little, collage elements are applied. 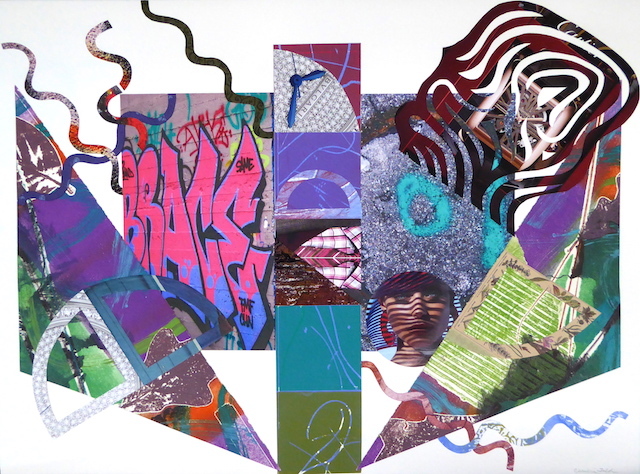 Here are several other finished collages. The exhibit “Contemporary Collage” opened at the Lincoln Center Art Gallery in Fort Collins, CO on November 10th and included six of my collages. 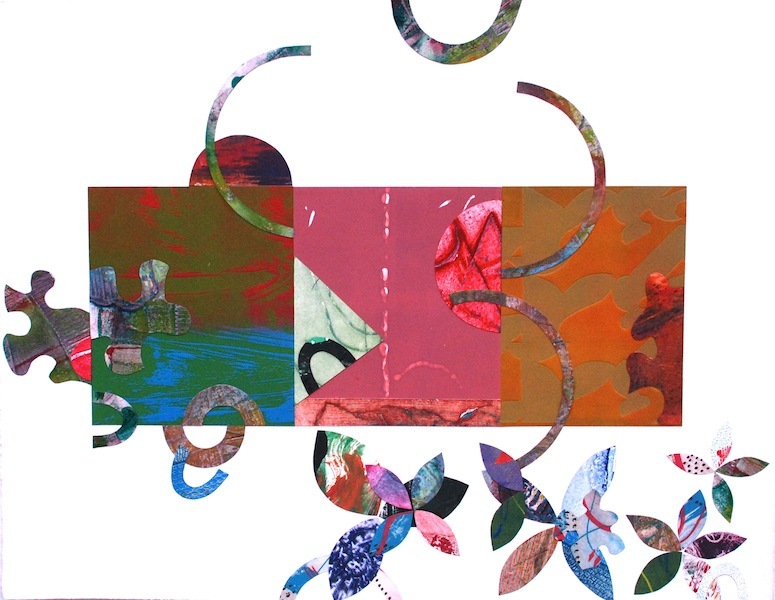 For this exhibit I selected a group of collages from the series “Have Map Will Travel.” They deal with the kinds of relationships all my work addresses, color, shape, line and texture. I construct the collages on paper using my recycled prints (monotypes, collagraphs, etchings), photos (mine) and found paper. In this ongoing series I add sections of maps, which I have photographed (I can’t bear to cut up old maps) and printed. The map shapes may or may not denote places where I have traveled. They help lead the eye in and around the collage. 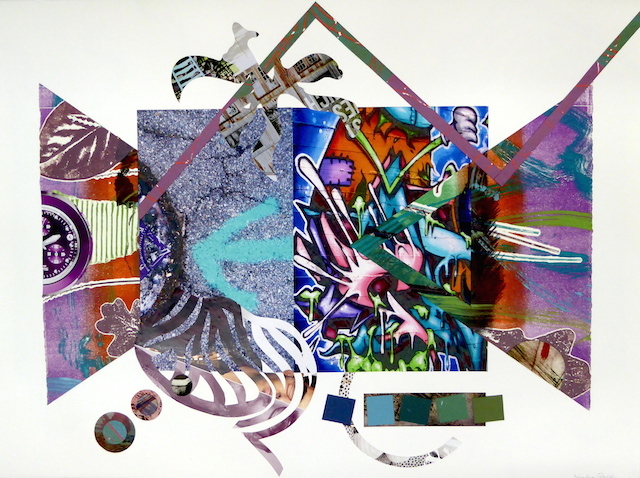 Here are my collages and the gallery information. If you live near Fort Collins I hope you stop by to see the show which ends on January 9, 2018. Viewing art is always in season! 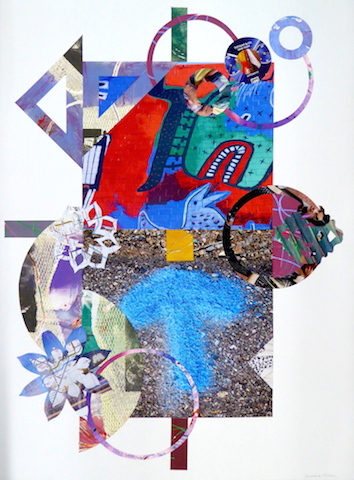 I will have several collages in an exhibit called “The Essential Nature” at the Bath House Cultural Center in Dallas. It opens with a reception on Saturday, September 2, 2017 from 7-9PM. The Bath House Cultural Center is at White Rock Lake, a delightful place to be on a balmy late summer evening. 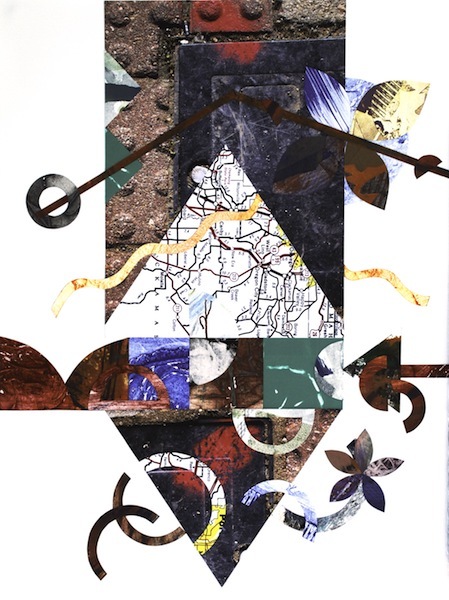 The collages are from the “Have Map Will Travel” series. 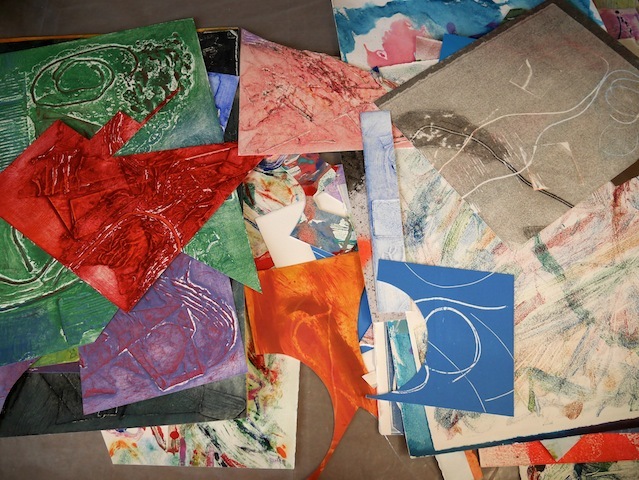 They combine pieces of my etchings, monotype and collagraph prints (recycled) and all kinds of found paper. Maps are there, too. The emphasis is on spatial, shape and color relationships. The story is your story. 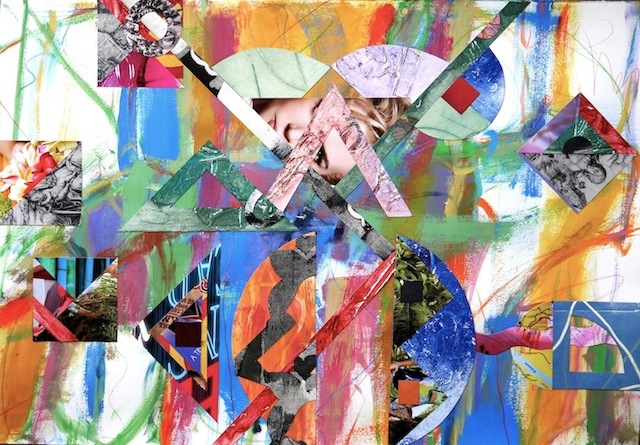 Here is a sneak preview of the collages. Come see the real thing. I hope you can join me and a terrific group of artists showing a variety of work at the end of summer, almost fall. 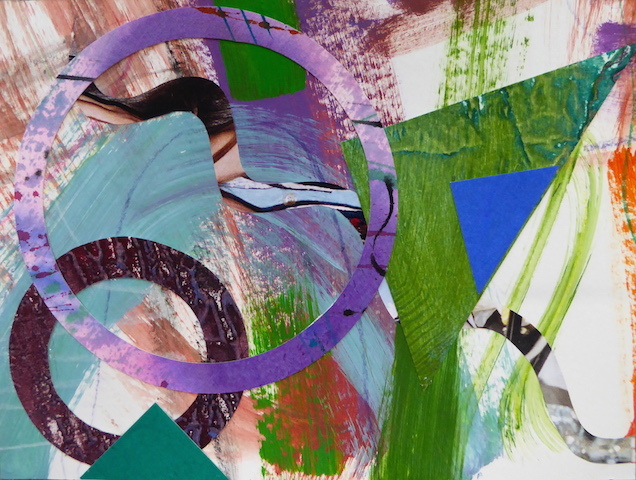 I often construct my collages on acrylic painted paper. 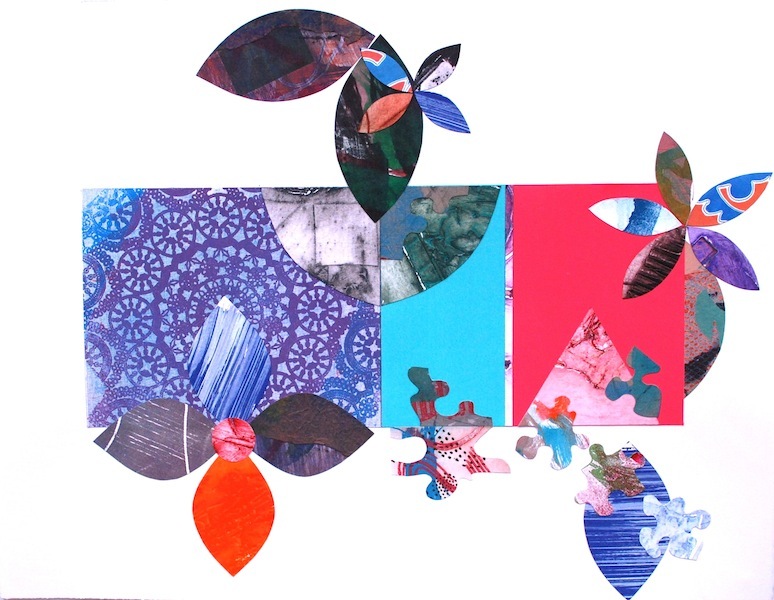 For a recent group of collages I layered stencil shapes cut from discarded prints (monotypes, collagraphs, etchings) and other found paper on the painted background. I needed one more element to make the collage POP. I found it by using acrylic “spreads.” Never heard of them? 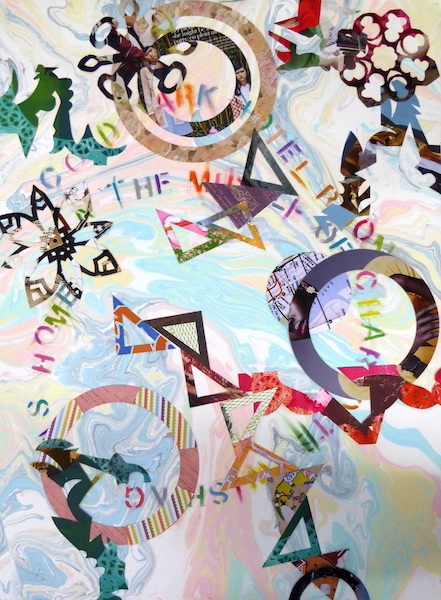 Spreads are made by painting acrylic paint or paint + gel medium on a releasing surface like plastic, letting it dry really well, then scraping it off and gluing it to the collage paper. They’re a little tricky to make, but they’re fun to make and fun to incorporate into the collage. They add texture and a bit of 3-D to the flat surface. Here are some examples from the “Hidden In Plain Sight” series. 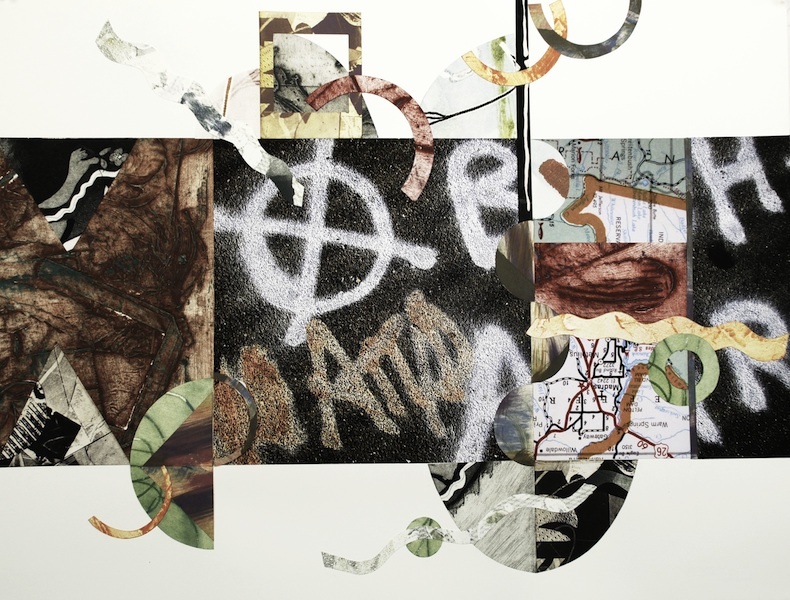 I continue to use pieces of my photographs, like the underfoot and graffiti images with discarded (you could say re-purposed) prints and found paper. 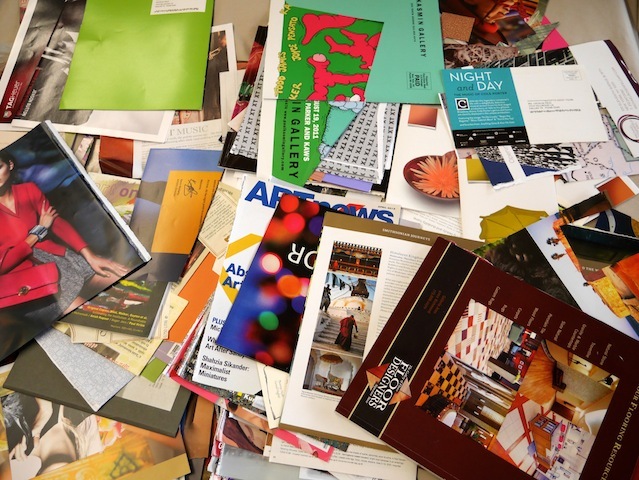 May I say “ephemera?” It sounds so much more sophisticated. 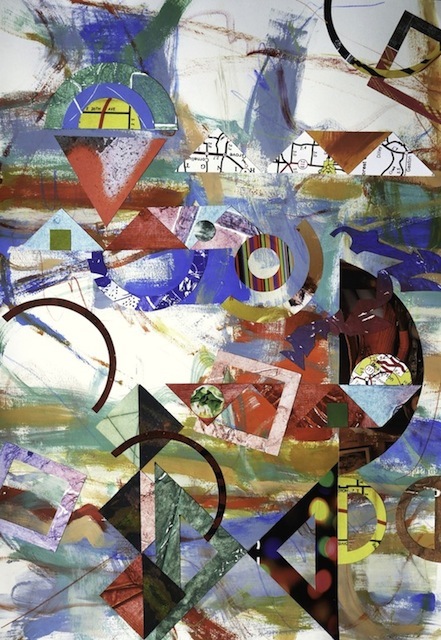 The compositions extend in all directions on a white background. Here are a few recent examples. 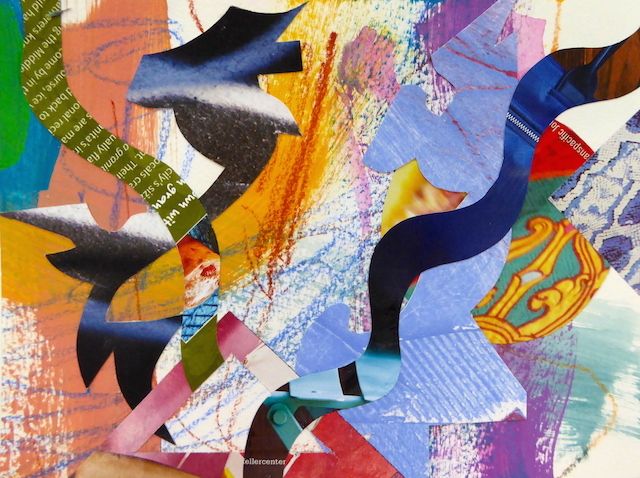 Sometimes you have to go “small.” Same idea, collage on painted paper. What happens when you try to downsize? What do you pick and choose to take? Ugh, you say. Well, I have to make the same sort of decisions every time I look at the paper. 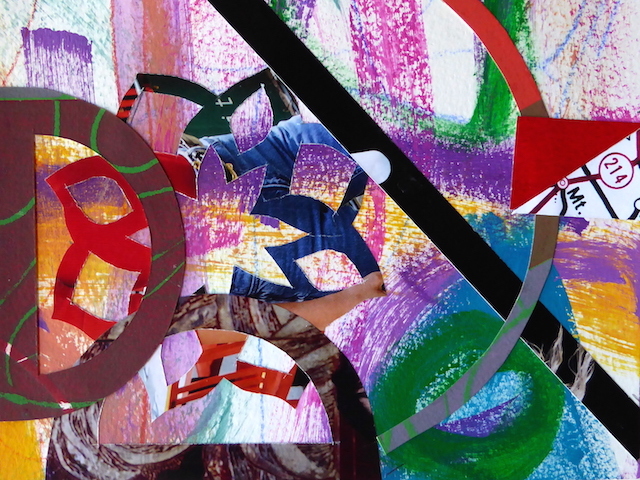 I made a series of “minis” called “Mini-Go-Round.” They are 6×8”, a lot smaller than 16×20”, 22×30” or 29×41”, my usual sizes for collage. 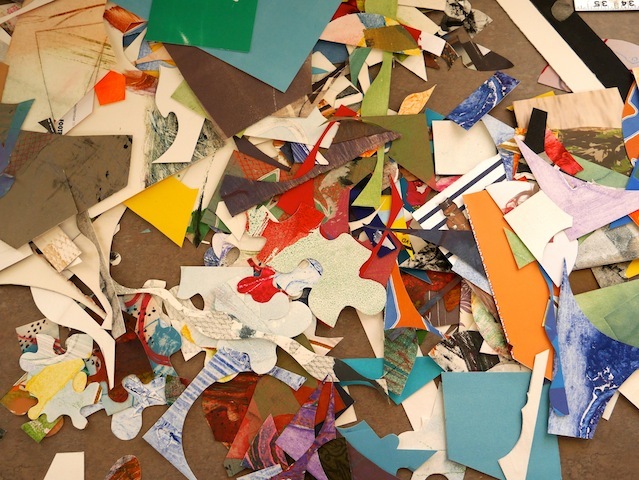 How would you design a collage on a small piece of paper? Here are my “minis.” Remember, they are small. Have you made collages? What’s your approach? When I think about my work (because people ask) I realize it is always about exploring possibilities. Sometimes it’s moving forward, sometimes it’s stepping back. Inspiration can come from anything and anywhere, as complicated as the arc of travel, as simple as the mash up of colors in a bowl of fruit salad. A story, a piece of fabric, architectural details. How do I process all of these sensory experiences? How do I express them? It’s a balancing act. Assessing, revising, adding, subtracting. 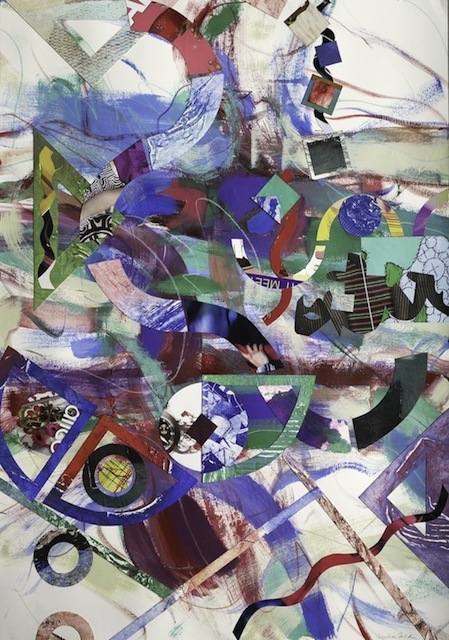 The paintings and collages, for instance, are the result of the interplay of line, texture (real or implied), negative and positive space, and color (or lack of). How do the parts relate to the whole? Where is the harmony? The dissonance? 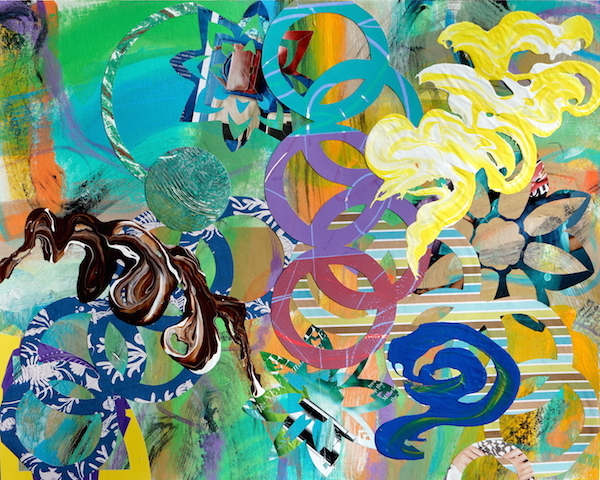 Experience with materials and technique is layered over intuition. One person’s “serious” is another person’s “playful.” What are the connections within a work and to others that form a series? Must it tell a story or can you connect with it on a different level? Do you seek out metaphors as you study it? “… the eye of the beholder” may sound trite but it’s important to note that you, the viewer, bring much to the work to help you understand it. I have no control over how viewers will interpret or connect with my work. I give up control once I determine it is finished. Then, on to the next. 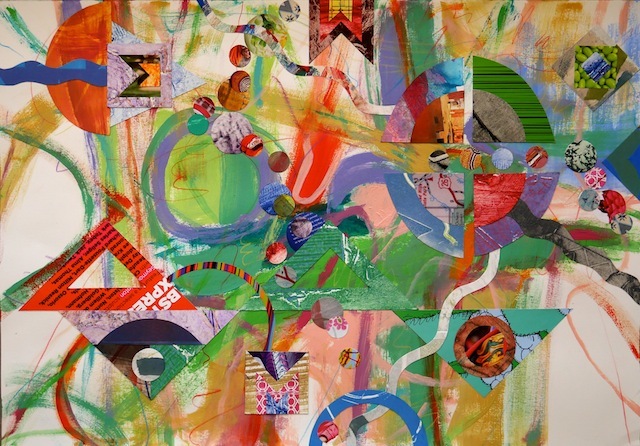 You can find more collages, plus paintings, prints and photographs on my website www.studio7310.com. Have at it! P.S. If you subscribe to my blog it will go straight to your inbox. 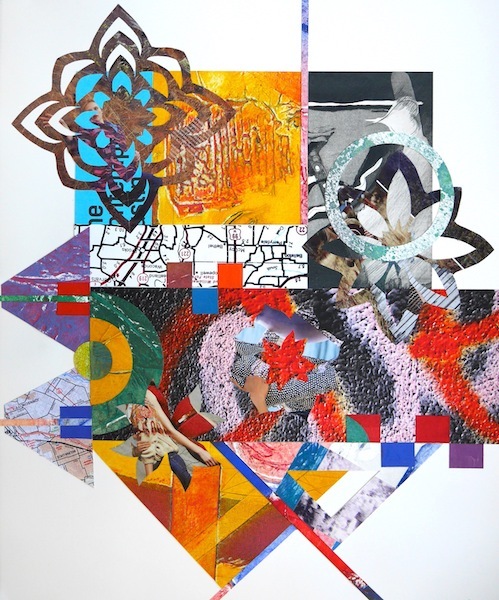 I will be exhibiting collages and mixed media paintings as part of an exhibit featuring me, Alsison Jardine and Carol Ordemann at modartists gallery in Dallas. 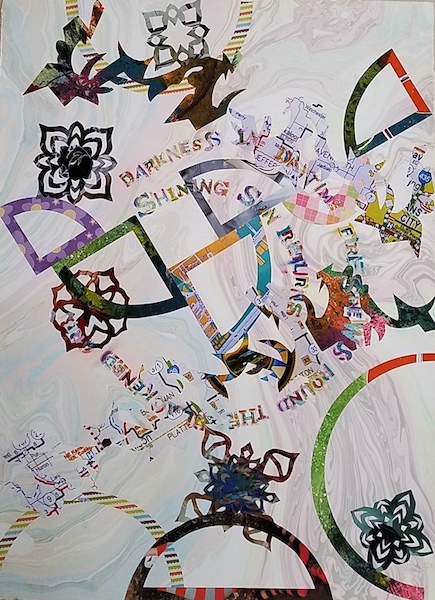 The exhibit opens on Saturday April 25 with a reception from 5-8pm. 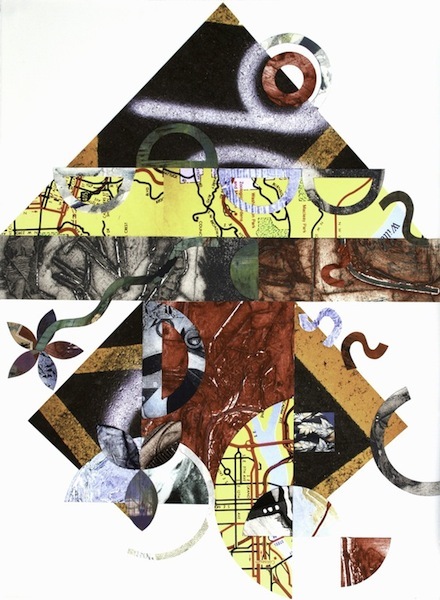 My collages, assembled from collagraphs, monotypes, etchings and found paper, and mixed media acrylic paintings all deal with the nature of abstraction. 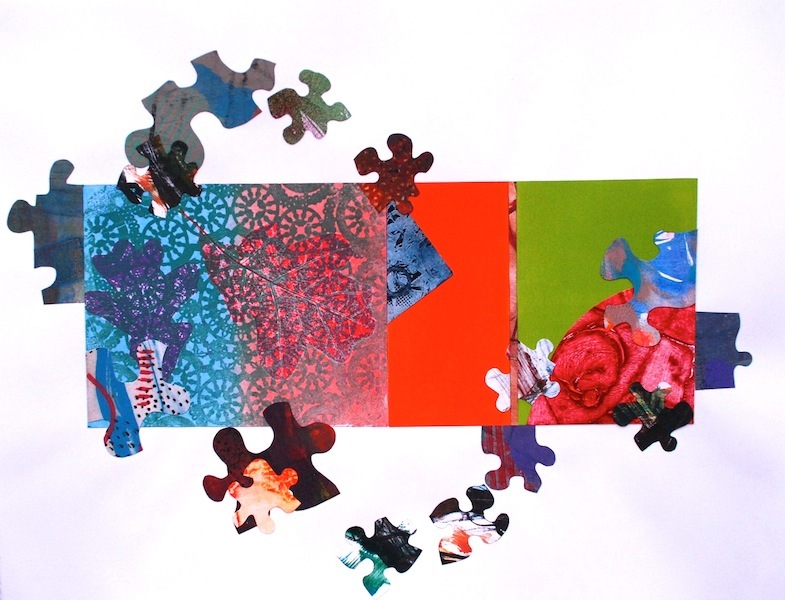 My work, whether in printmaking, painting or collage is about exploring relationships. Bits and pieces from my visual experiences bump against each other. There are references in my work to the textures, colors, lines and shapes of things in the real world. 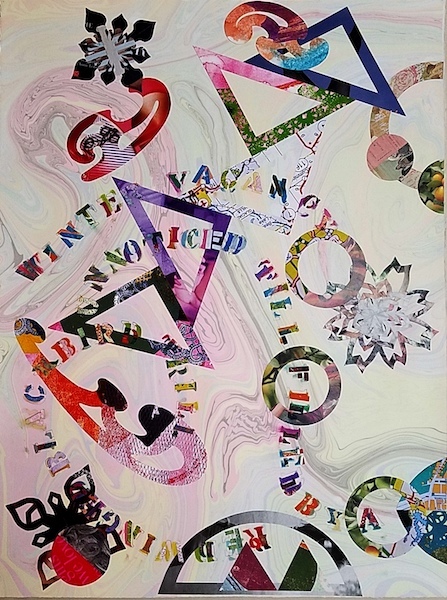 The layering or unfolding of shapes, punctuations or expanses of color or character of a line order the picture plane. 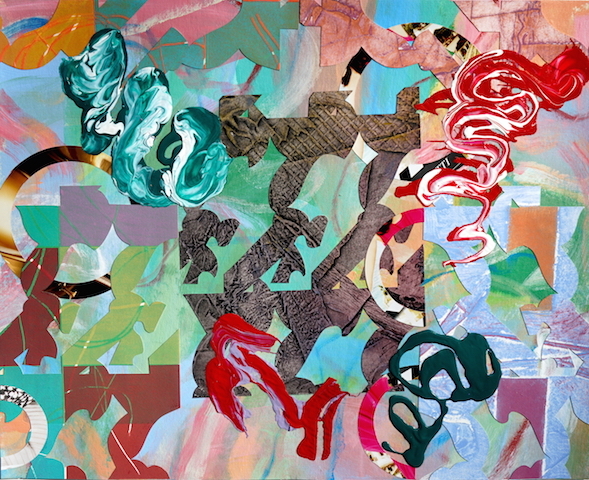 The resulting abstract images often allude to natural forms. What if I limit my color palette, what if I work in a more minimal way or, on the other hand, what about excessive exuberance? Large or small? Paint or paper? Or both. Anything can spark an idea – something seen, heard, imagined. The results are often unexpected, and even though I may have some idea of the general direction, like jazz, there can be many twists and turns along the way. Each step, expected, or unexpected, is the impetus to continue the exploration or the journey in this painting or print or the next one. Serendipity is the hallmark of my work. I love the unpredictability of working with paint, paper, ink and plate. 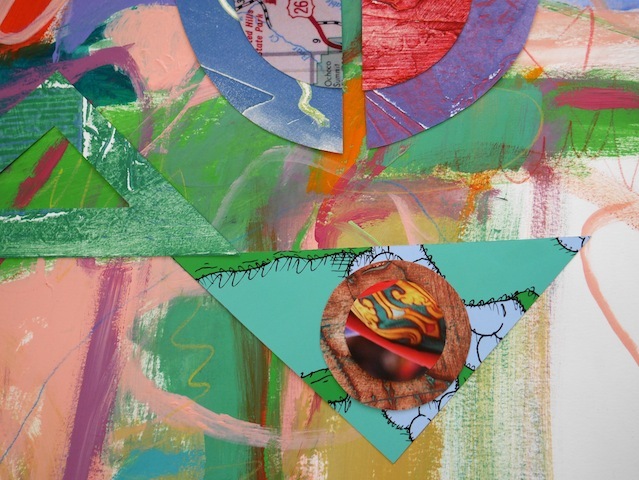 This body of work consists of collages on paper and mixed media acrylic paintings. 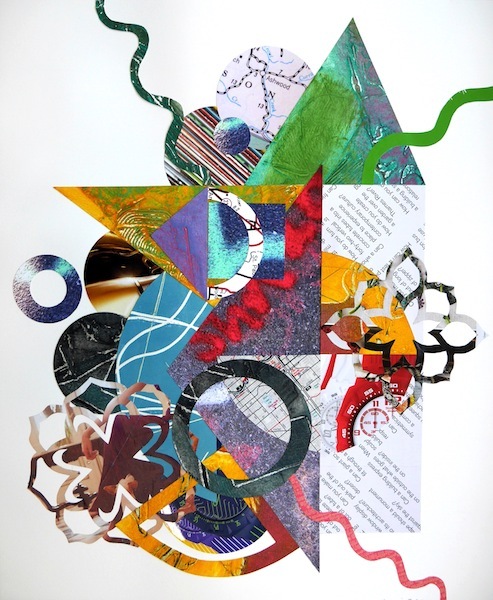 I recycle parts of my monotype and collagraph original prints and photographs with found paper from various sources. 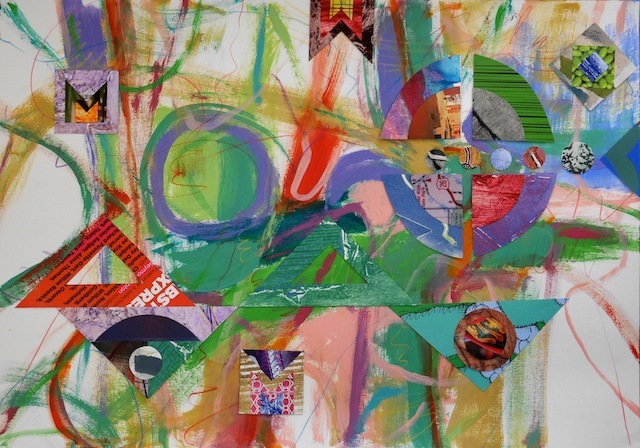 The collages and paintings are non-objective; the emphasis is on the relationship of line, color, shape and texture. Working in one medium, i.e. 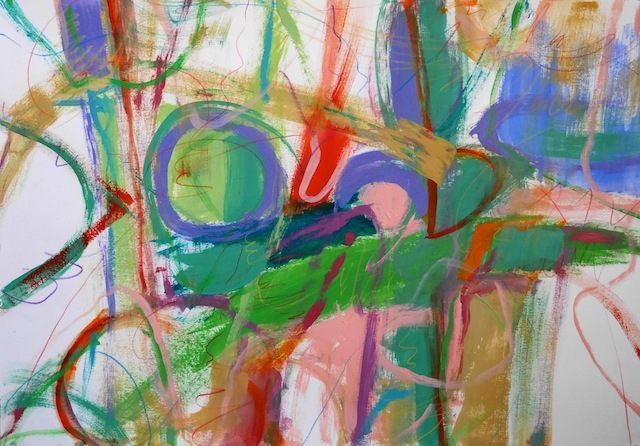 monotype prints, usually leads me down another path because I’m always asking myself “what if?” What if I limit my color palette, what if I work in a more minimal way or, on the other hand, how about excessive exuberance? Large or small? Paint or paper? Or both. Anything can spark an idea – something seen, heard, imagined. There are always new avenues to explore. Looking down can be rewarding. My “Underfoot” series of photos started when I had my head down and noticed the interesting abstract pattern of street and sidewalk marks made by construction workers. We seldom pay attention to such marks but they resonated with me and I began to photograph them wherever I traveled. 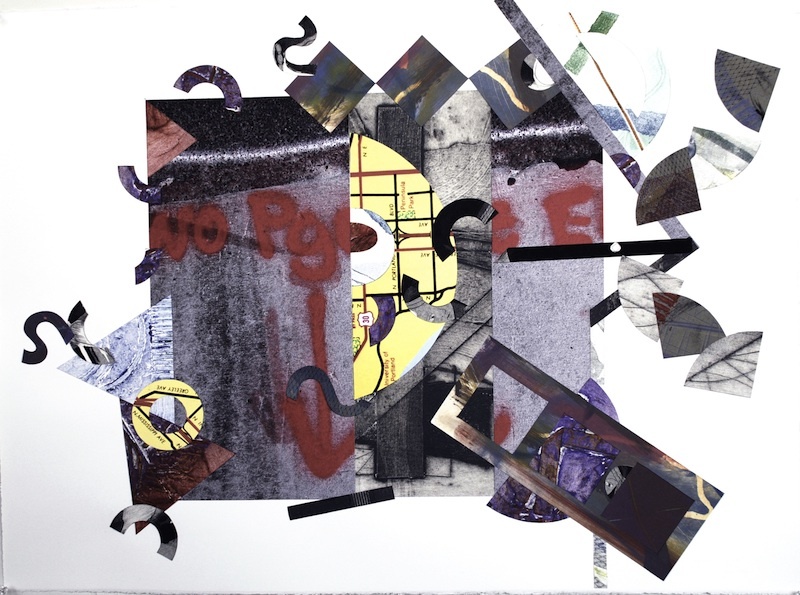 Combining my prints (re-purposed etchings, monotypes, collagraphs) with found paper to create collages took my work in a different direction. Cutting up and adding the “Underfoot” photos seemed like a logical next step. 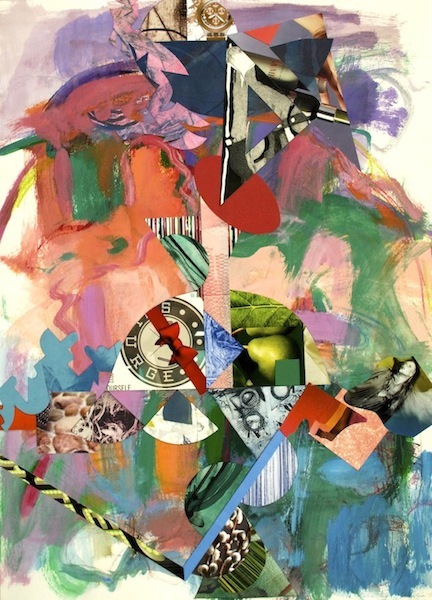 Their abstract quality echoes that of the other elements in the collage. 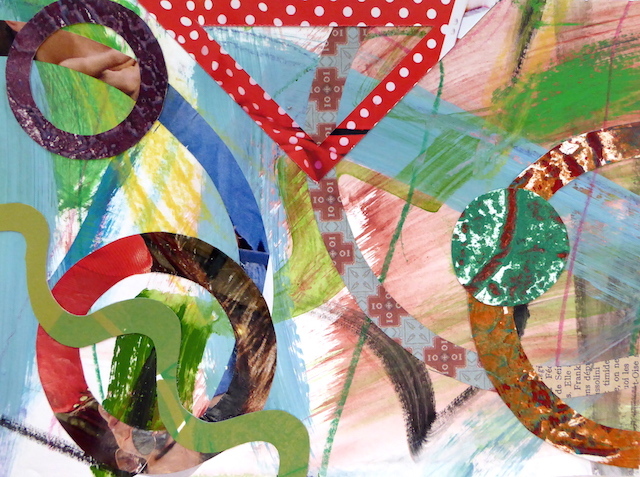 Sometimes I assemble the collage on painted paper. 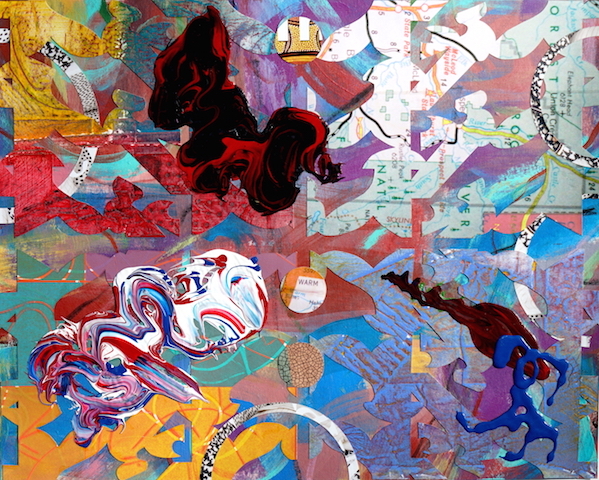 The acrylic painting weaves its way in and around the collage. Negative space and positive space play games with one another. 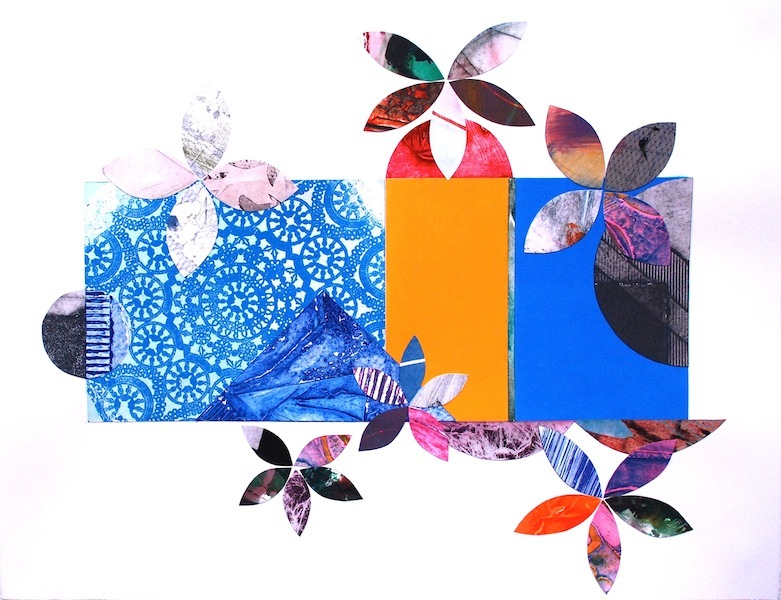 The group of collages in this exhibit called “Springtime Suite” is colorful and energetic and was inspired by a visit to the Dallas Arboretum when it was ablaze with color. 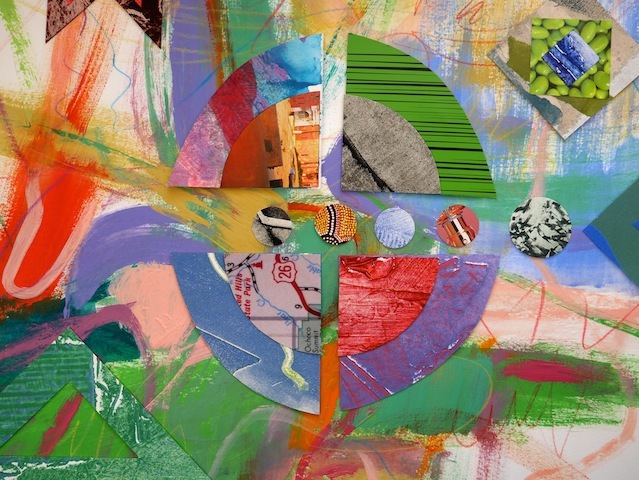 Here are the “Springtime Suite” collages in this exhibit. Here are some in the exhibit. 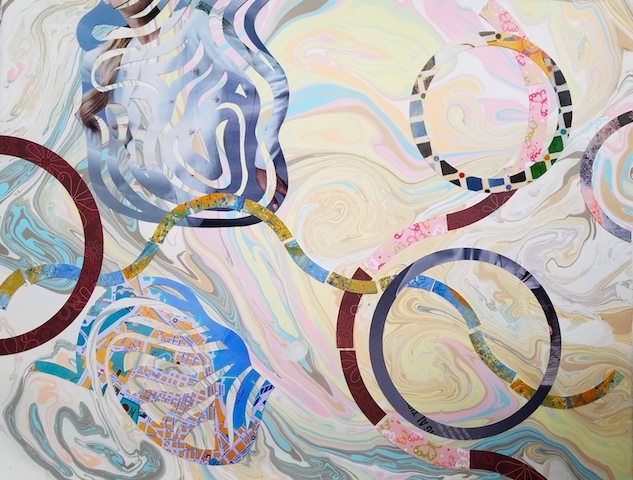 The mixed media paintings are whirlwinds of line, color and texture. 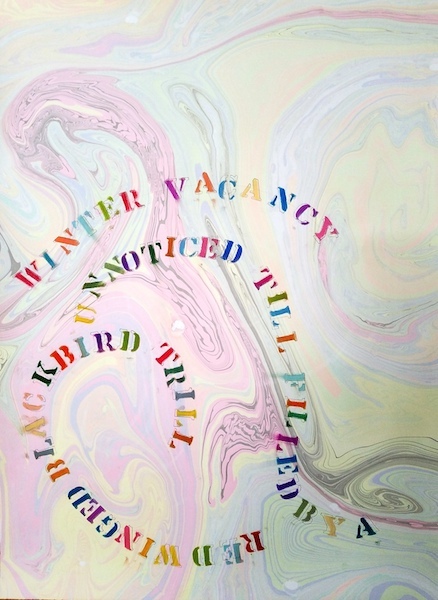 The show runs through November 29 at Ilume Gallerie, Dallas, Texas. On November 1, 2014 I will be meeting and greeting at the opening reception for my next exhibit. It’s at Ilume Gallerie on Cedar Springs near Oak Lawn in Dallas. 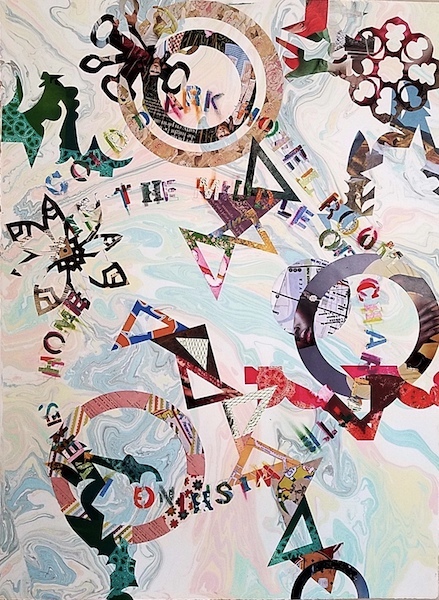 The exhibit consists of collages on acrylic painted paper from the “Springtime Suite” series and collages from the “Have Map Will Travel” series. 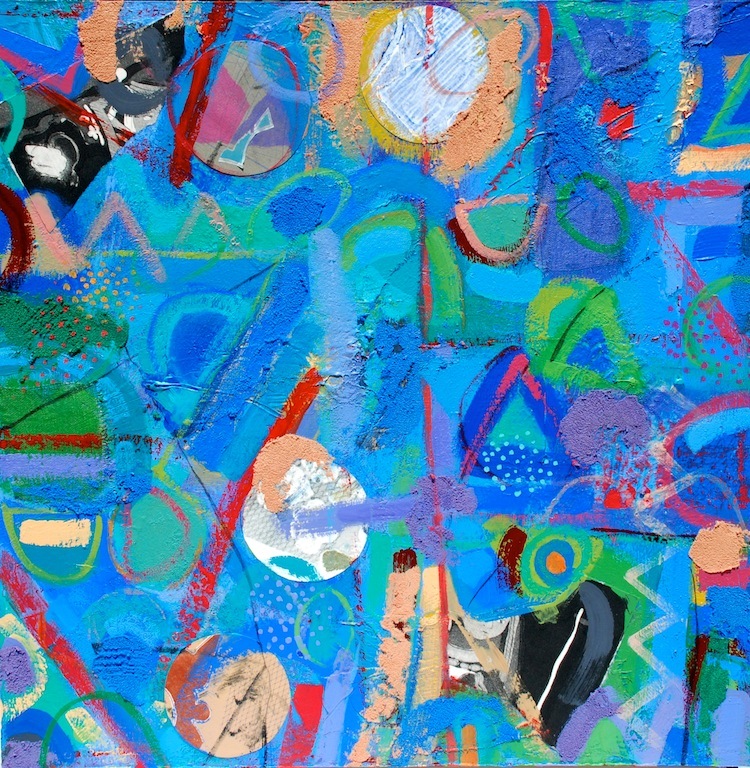 I’ll also be exhibiting several mixed media acrylic paintings on panel. 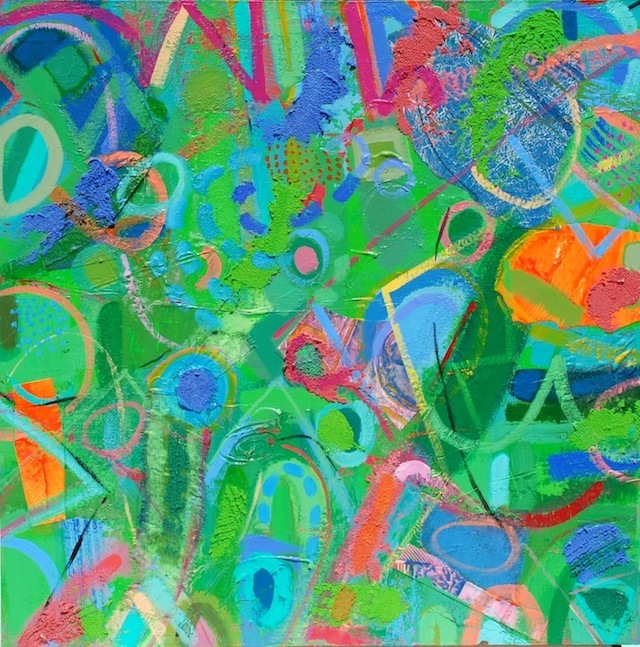 It’s a high-energy show with lots of color and movement in each piece – so get your groove on! Check out one of the paintings in the exhibit. 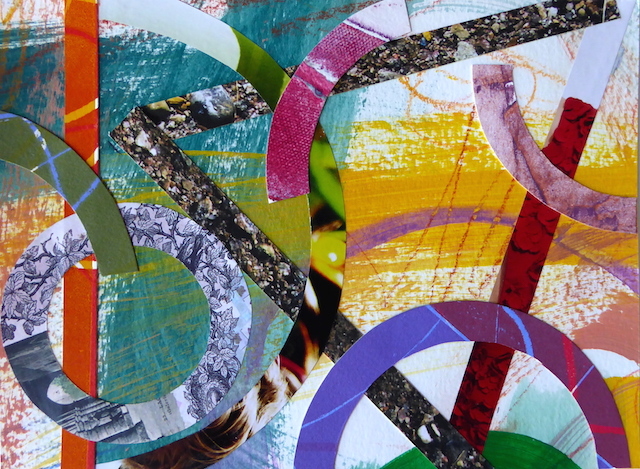 When it comes to making collages my mantra is re-cycle, re-purpose, re-use. 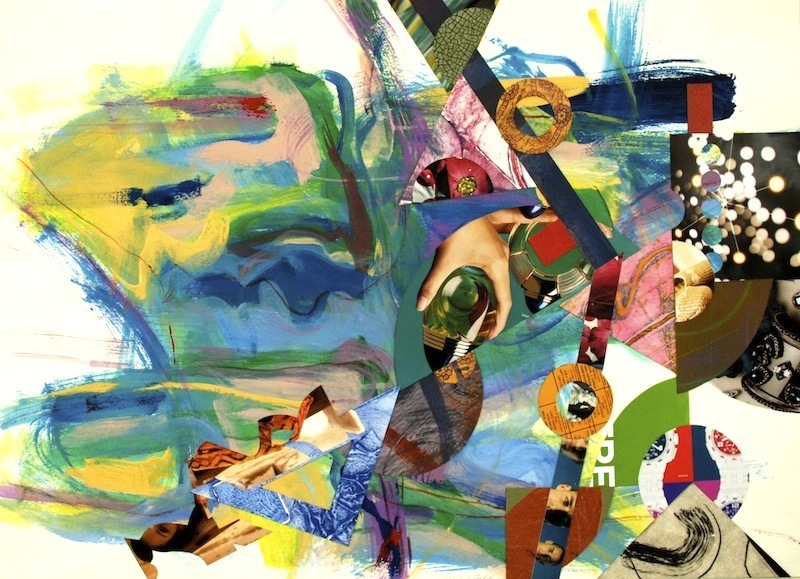 If “all’s fair in love and war”, so it is with collage making. 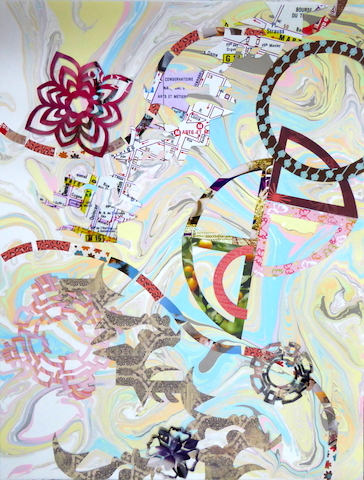 There are as many ways to make a collage (2D, 3D, mixed) as there are materials. 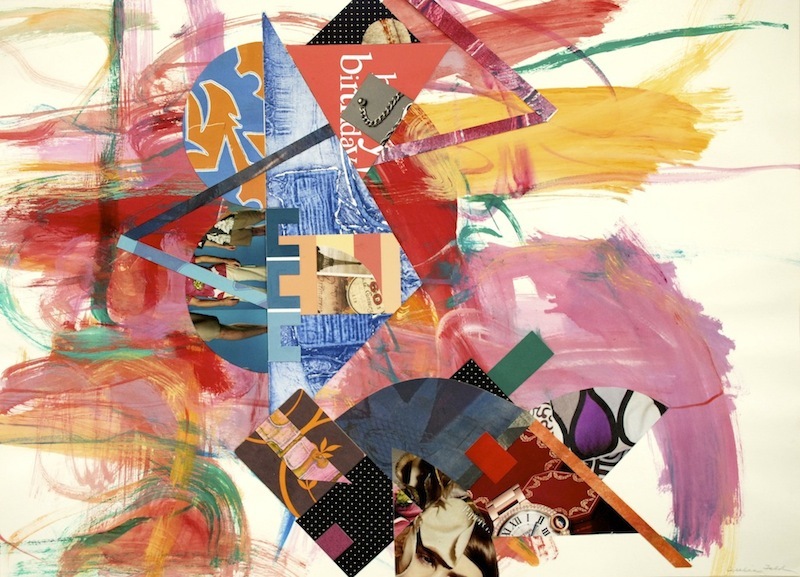 (Definition: Collage derives its name from the French verb coller, to glue. The work of art is made by gluing things to the surface). I start with the scary white paper. Blank. Nada. 100% rag, acid free, often Rives BFK, a lovely, heavy paper excellent for general printmaking. Sometimes I start by painting on the paper with acrylic paint or making a monotype. Next comes stash busting. I peruse all manner of my previous prints (etchings, monotypes, collagraphs). The un-wanted. Un-loved. I sort through ephemera. Peruse, then pick. Decide on shapes. Cut out. Add, subtract, shift around, overlap. 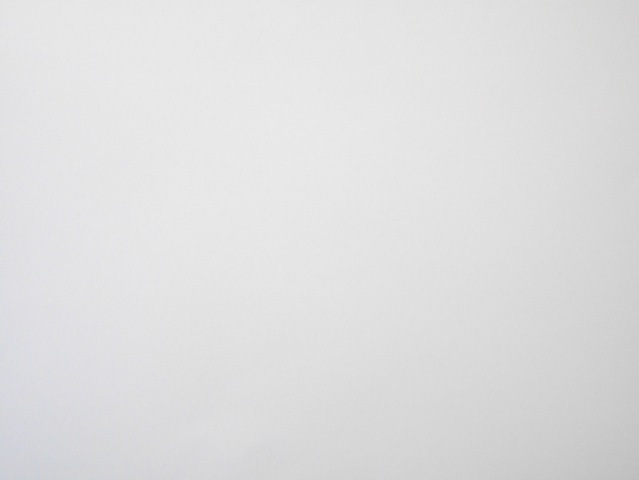 Build layers. Do not glue down. Changes might have to be made. Do not sneeze or jostle. 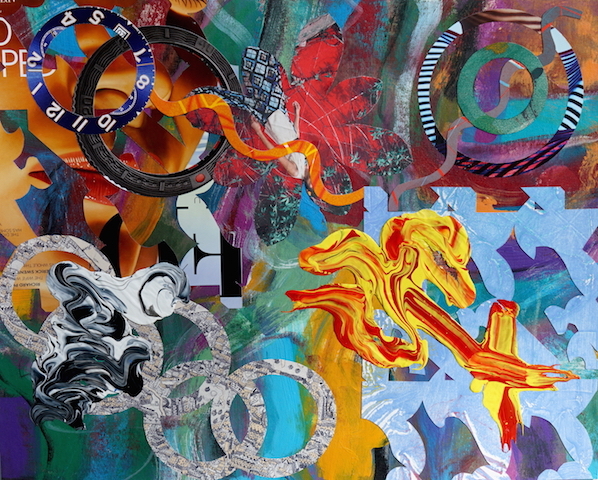 Here is the collage in progress with a few details. Time to glue down all of those little pieces. To help me remember where they all go once they are lifted off the paper I make a few sketches with notations plus marks on the paper for shape locations. Then I remove a section at a time, add acrylic medium for “glue” and weight it down. This is where those old phone books come in handy. 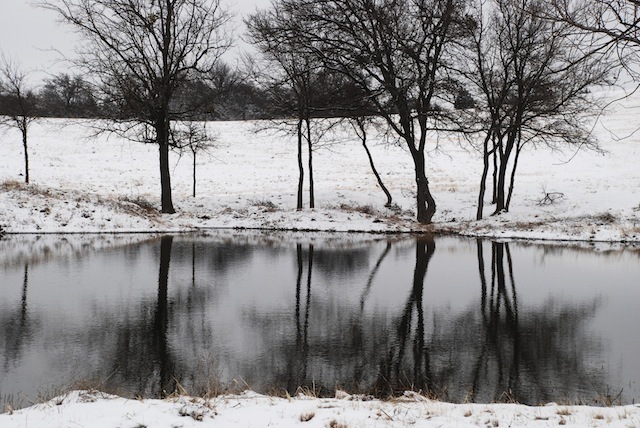 This is the view of Woodcreek Ranch from my studio window. It’s what I see while I wait for the glue to dry. 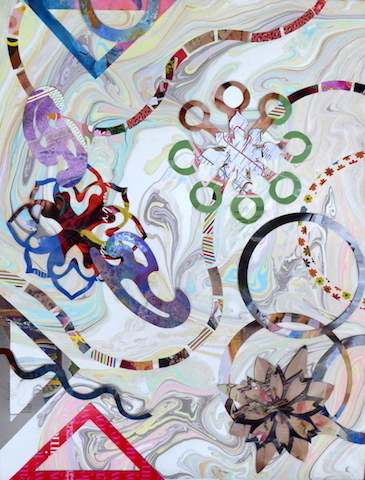 I return to the collage and repeat the process of removing, gluing, weighting down and staring. Until it’s finished. 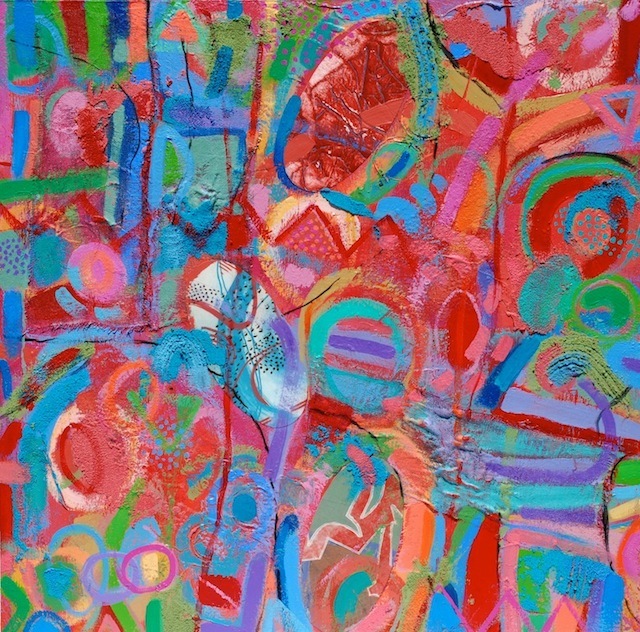 ©2012 Cecelia Feld, Studio7310. 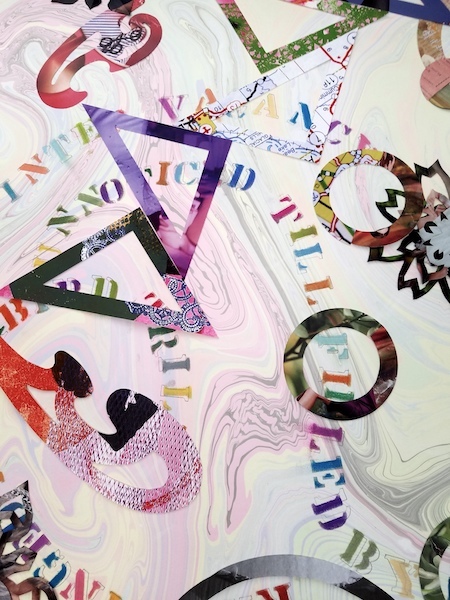 All text and images copyright Cecelia Feld. All rights reserved. Please contact cecelia@feld.com for permission to use.